To say St. Albans isn’t known as a culinary hot spot is an understatement. When I mention dining in the Franklin County city to people in greater Burlington, they often guffaw. Images of frozen, out-of-a-bag food dumped in a deep fryer are prevalent. Events like the Taylor Park Fine Wine, Beer & Food Festival are designed to prove them wrong. Last Saturday at one o’clock, the city’s downtown farmers market was beginning to wind down. Vendors offered felt hand puppets alongside booths selling produce, Bosnian food and something billed as “smoked salmon waffles.” But toward the back of Taylor Park, a long line of attendees slowly snaked into a pair of large, white tents for the main event. Inside the first tent, I perused the fest’s silent auction. How could I resist bidding on the 3-foot-long sandwich from Tatro’s Gourmet Soup & Sandwich? It was the first giant hoagie I’d ever seen up for auction — anywhere. I also scoped out my dining options. A $25 ticket bought unlimited food, wine and beer from the vendors. They included some out-of-town producers of cheese, such as Does’ Leap and Vermont Butter & Cheese Creamery, and of wine, such as Honora Winery & Vineyard and East Shore Vineyard. But every restaurant serving small plates was from St. Albans proper. I started at the table belonging to Blue Acorn, a classic American restaurant that opened in July. 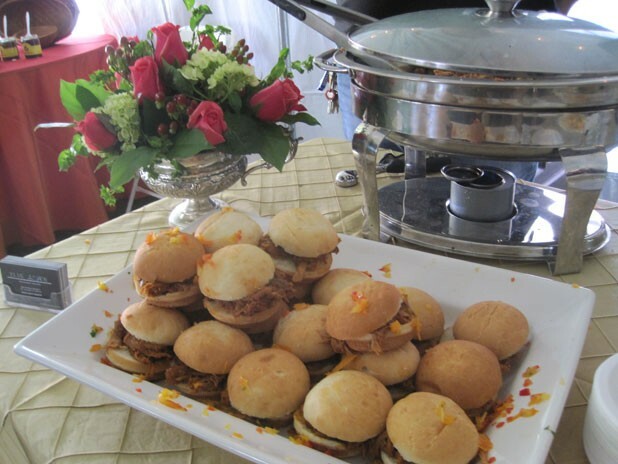 Pillowy round buns filled with pulled pork were covered with red and yellow peppers like a scattering of autumn leaves. On the other side of the long table, Blue Acorn owner Tim Cray’s mother, Pauline, had laid out an array of treats. Pauline Cray owns Back Inn Time, a historic bed-and-breakfast just up the hill from Taylor Park. Her veddy British chef, Cathy Cromack, was frying green tomatoes with pancetta and wine to order. The delicious dish was the only one on the table that featured meat. A tricolor beet salad was decadently sweet, with the roots roasted to an ideal al dente. Roasted corn chowder screamed freshness and served as a wonderful summation of the harvest season. Eastern Dragon, a casual Chinese and Japanese eatery on Main Street, had sent its sushi chef with a wide array of rolls. I was particularly fond of one stuffed with thin slices of tofu skin and cucumber. Decent sushi in St. Albans — who knew? Grand Isle’s East Shore Vineyard shared a table with Eastern Dragon, a seemingly surprising alliance. The pairing made more sense after a sip of the vintner’s Traminette, a sweet and dry white that went well with soy and ginger. It probably would have been exquisite with Chow! Bella’s dish, too. Chef Connie Jacobs Warden had cooked up a preview of her winter menu, which will debut in three weeks. A crisp slice of beef and veal sausage, dipped in creamy mustard sauce, was the centerpiece of an Alsatian dish that also included sharp potatoes au gratin and sweet, tender cabbage braised with apples and onions. My old favorite One Federal occupied the next tent, serving a ridiculously moist pork shoulder. Co-owner Erika Hamblett told me her chef-husband, Marcus, had begun smoking it the night before, using their neighbor’s cherry wood. The barbecue sauce, though unnecessary on the mightily flavorful meat, was made from the couple’s own tomatoes and maple syrup. I finished the afternoon with a stop at Cosmic Bakery & Café’s table. The bakery’s new seasonal cheesecake flavor, pumpkin, was light but firm, with just enough pumpkin and lots of spice. Cinnamon, the dominant flavor, combined delightfully with the graham-cracker crust. Sated, I realized my St. Albans harvest had proved more fruitful than I could have imagined.